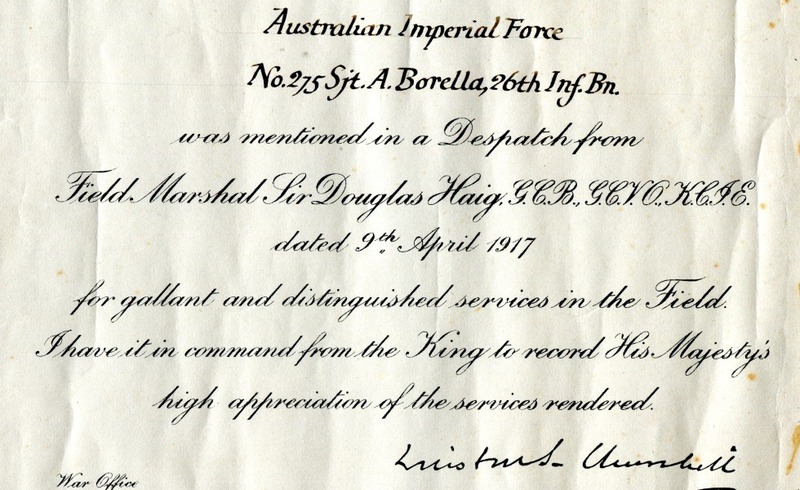 Albert Borella received a Mention in Despatches “For devotion to duty and general good work in the trenches" since the Battalions deployment to Gallipoli and France. 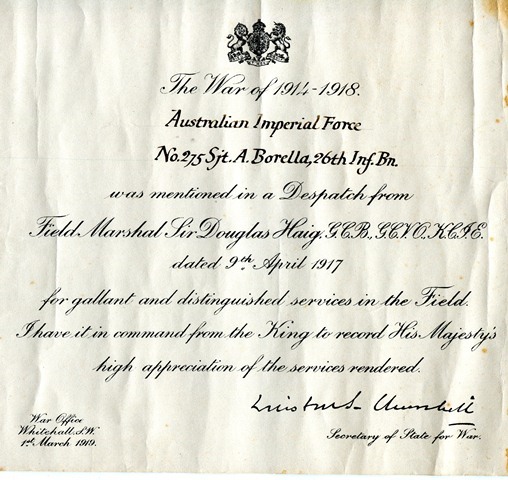 Borella’s Mention in Despatches certificate contains two of the most famous names in military history: those of Field Marshal Sir Douglas Haig, and Winston Churchill, Secretary of State for War. Borella would have prized this immensely. He would have been appreciative of the honour of the MID, but he would have revered the two names on it. Haig was a very capable general. Churchill had been behind the Gallipoli campaign – which nearly succeeded, and for that he would have been lauded immensely – but as it was he was sacked. He took his Army commission which he still held, sought, and was given, a position with on the front lines, where he saw battle. Later, he was elevated once more to high government rank. “Winnie’s" immense abilities shone out like a lighthouse. 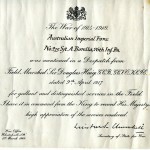 Borella’s Mention in Despatches was officially gazetted in London on 1st June 1917.